It’s time for Elmhurst’s first Christmas Tree Lighting and the appearance of Santa Claus himself on Friday evening, November 16 at 6 p.m. This festive annual event is brought to you by the Spring Road Business Association and features Christmas carols, refreshments, jolly old St. Nick and the lighting of the majestic tree decked out in all its holiday glory! The Christmas Tree Lighting has always been a favorite among Elmhurst families, and all of us at Elmhurst Toyota encourage you to attend. The evening begins at 6 p.m. with the sound of Christmas carols sung by local elementary school students. At 6:30 p.m., Santa Claus arrives in style on a fire engine, followed by the highlight of the evening when the Christmas tree is lit. Stay warm with hot chocolate and cookies as the children visit with Santa until 7 p.m. The Christmas Tree Lighting takes place at the gazebo at the intersection of Prairie Path and Spring Road. This fun, family-friendly event is sponsored by the Spring Road Business Association, an organization started by Elmhurst businesses back in 1950. The association sponsors events and activities in Elmhurst year-round. The weather forecast for Nov. 16 should be cool and dry, with expected temperatures in the mid-to-low 30s, as usual. 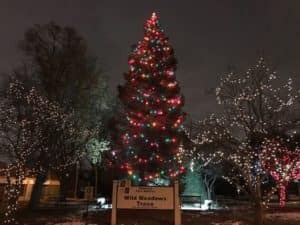 So, bundle up the family and come out to celebrate Elmhurst’s first Christmas Tree Lighting and Santa Claus visit of the season. We know this is going to be a great event and we hope to see you there! Elementary school students singing carols: 6-6:30 p.m. Arrival of Santa and Christmas Tree Lighting: 6:30-7 p.m.
Visit the Spring Road Business Association website at www.springroad.com.